The Agilent 8657A offers excellent performance at an economical price. The low residual FM and excellent phase noise performance of these signal generators make them ideal for many in-channel and even out-of-channel receiver tests. 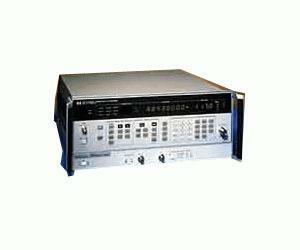 The Agilent 8657A is a versatile signal generator offering a variety of features, such as simultaneous and mixed modulation combinations of AM and FM, as well as a carrier phase adjust capability that allows you to characterize phase-sensitive devices. In addition, the Agilent 8657A offers a wide output range, +13 to -143.5 dBm, with superior level accuracy of ±1.0 dB. Built for reliability, the Agilent 8657A uses an all-electronic attenuator, which is backed with a five-year warranty to ensure that you will make consistent, repeatable measurements every time.